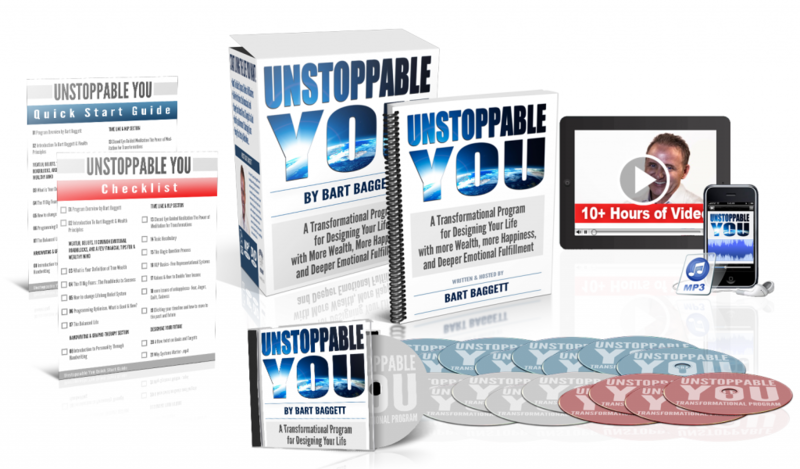 The Unstoppable Confidence Guided Meditation was created by Bart Baggett. For the past 20 years, Bart has been traveling the world speaking to audiences and appearing on TV and radio shows. He is best known as one of the worlds’ top Forensic Handwriting Experts. He is a best selling author, entrepreneur, professional speaker, trainer, consultant, and has even has appeared in feature films (just because it was on his bucket list!). A transformational program for designing your life with more wealth, more happiness, and deep emotional fulfillment. This is the 23-part companion program for the Unstoppable Confidence Guided Mediation System. Inside the Unstoppable You program, I not only explain the magic behind the guided meditation, but I walk you through designing your own based on exactly what you want and design an audio script to help you get that faster. As good as the 3 Unstoppable Confidence meditation audio tracks are… imagine one designed exactly for you in your own voice. I will show you the process. Controlling your inner voice and changing your internal beliefs. To achieve more success, find more solutions, and overcome your fears and blocks… you must master the ability to reprogram your own unconscious mind with intention. Empresse Publishing publishes many courses by Bart Baggett including Unstoppable Confidence, Success Secrets of the Rich and Happy, Facebook Marketing for Authors, Marketing Mastermind, and the 7 Step Self-Publishing Formula. Bart Baggett is best known as the world’s #1 Handwriting Expert and is a highly acclaimed professional speaker, corporate trainer, & TV personality. In addition to his business degree from Pepperdine University in Business, Bart has extensive training in Neuro-Linguistic Programming, Sales, Marketing, Human Resources, and Forensic Document Examination. Bart is the Founder of the Handwriting University International teaching and certifying handwriting experts worldwide. He is also the author of many other books, CS, and audio/video Home Study Courses, including the best selling Grapho-Deck® Handwriting Trait Cards. In addition to his writing and speaking, he has gained popularity as a media personality by appearing as a guest on over 1500 radio and T.V. shows. Bart’s sense of comic timing has thrilled audiences from Mumbai India to London England. HIs quick wit and sense of humor even landed him on the World Famous Comedy Store stage and continues to be a reason to bring him back on radio shows years after year. Naturally, this comic timing translates well to the corporate speaking community… where boring is never an acceptable option. He is currently living Los Angeles, CA, USA and travels worldwide as part of his speaking and consulting services.